PORT JERVIS—In the lead up to the approval of Port Jervis’ 2016 budget, phrases like “not easy to be swallowed” and “bare bones” foretold an 8.54 tax rate increase with zero added to city’s fund balance, no raises for the mayor or councilmen, and $1.2 million in debt payments. 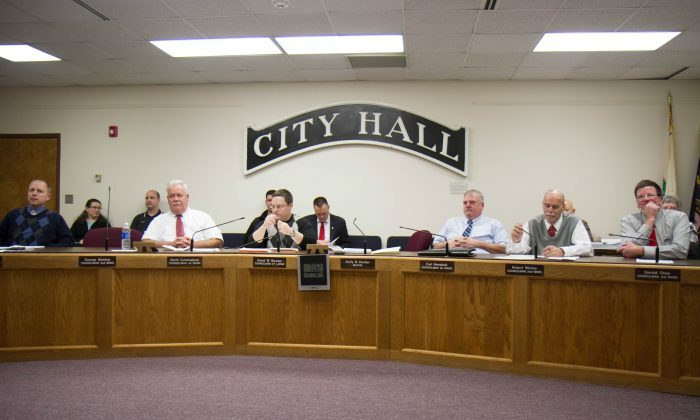 “I am asking the council to really be charged this year to look for those alternative revenues to create for our city so that we can take that burden of taxes away from the tax payers,” Mayor Kelly Decker said at the Dec. 28 meeting. He expressed concern that the city’s fund balance is at $250,000, which according to the state should be more like $1.4 million (10 percent of the budget) he said, and bemoaned the lack of funding for infrastructure repair and maintenance. The most immediate problem with this, he warned, is the underpass below MacArthur Circle, which is in need of repair. “There’s no money in any type of account set aside to work on the underpass and this is going to have to be a bond project from $1 million to $1.5 million to repair,” he said. Second ward councilman Richard Ritchie called the budget “unacceptable” and said he would like to see the city better market itself to tourists and business people looking to invest. Fourth ward councilman, Stanley Siegel, concurred. He was one of two councilmen who voted no to the budget, saying it could have been tightened up, and alternative revenue sources found. He proposed a one-year moratorium on salary increases for department heads, no changes to police and the civil service union contracts for one year, and increased fees to landlords of vacant, abandoned, and boarded up buildings as a way to lower taxes. He also suggested reducing the summer recreation program, using Department of Public Works personnel for demolition work, and getting dual recycling and garbage trucks for the city among, other things. One boon for the budget is that the tax rate increase is half of the 17.4 percent proposed in the mayor’s budget. That is due in part to the final budget cutting $42,000 for the Port Jervis Volunteer Ambulance Corp., removing $124,586 from the Police Department budget and $343,744 from retirement payouts, among other cuts. The final budget also anticipates $149,600 more in revenue. However it is still $354,167 over the allowable tax cap. Wayne Kidney, a former building inspector for the city and a resident of the first ward, was the only one in the audience who spoke after the budget was passed. The mayor thanked the public for their participation in the budgeting process and the council members for their work, time, and energy. On Jan. 5, a correction was made to to clarify that the percents given are increases, not the actual tax rate. Epoch Times regrets the error.